Fundraising entertainment as famous faces from the worlds of sport and television come together in the name of charity. Browse content similar to 2014. Check below for episodes and series from the same categories and more! Highlights from the 2014 event, including a special Only Fools and Horses sketch. Coverage of the Sport Relief Games live from the Queen Elizabeth Olympic Park. Paralympians take on Strictly and Only Fools returns in the fundraising spectacular. 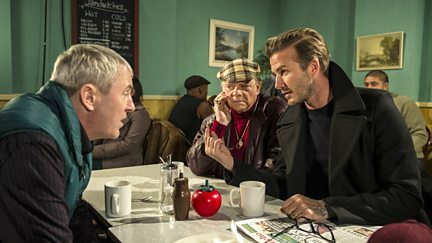 A look behind the scenes of Only Fools and Horses and more celebrity sporting challenges. Andy Murray joins Mock the Week, Kylie performs and Jack Whitehall takes on a challenge.